The Metro Center V, located in Dublin, Ohio, was constructed in 1985, totaling 219,414 square feet. The nine-story, multi-tenant, office building underwent a renovation in 2014 and features an on-site health club facility and cafe. In 2018, TEU Services completely upgraded the interior and exterior lighting. The owners of this aesthetically pleasing structure sought a solution that would provide a uniform look while lowering the overall energy and maintenance costs. The Atrium lights in particular were only maintained once a year due to the height and placement of the existing fixtures. The appeal of this beautiful building is complimented by the new LEDs. The Kimble County Courthouse near the Llano River in Junction, TX is a beautiful landmark. 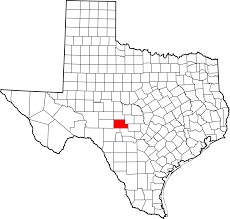 Junction, located at the junction of the North Llano and South Llano river, is a terrific destination town for overnighters at the State Park and for deer hunters. The construction of the Courthouse dates back to 1929. Energy efficiency was not a focus in those days and the color of the lighting was not an option. The old fluorescent lighting inside the offices and courtrooms flickered and hummed while the exterior was painted orangish-yellow at night. exterior to revive the beauty of the building for the nighttime passersby and to enhance visibility for safety purposes. The white LED lighting selected provides an even distribution of light around the building with beautiful results. Interior lighting was upgraded to Natural White LED light for the office spaces and courtrooms. All of the old decorative Edison style bulbs were upgraded to the same color as the functional 4ft LED tubes used in the offices. A uniform lighting color and appearance was achieved throughout the Courthouse. Since 1989, Mark and Sallie Armstrong have served hill country favorites for every appetite. The Lakehouse overlooks the Guadalupe River and that view combined with the casual atmosphere makes it the perfect spot to unwind and enjoy a relaxing meal. The original incandescent bulbs burned extremely hot giving them a shorter lifespan. Failed bulbs had to be replaced each day. The new LEDs installed are guaranteed for 5 years and if any fail in that time TEU handles the maintenance. The older parking lot light fixtures insufficiently illuminated the center of the parking lot due to the spacing of the parking poles. Replacement fixtures of modern design were installed to direct more light down and towards the center. A year later TEU rolled digital signs into the REDAAP program. Mark welcomed the idea of working together again and growing his customer base and thus his sales by attracting the people driving past the restaurant. 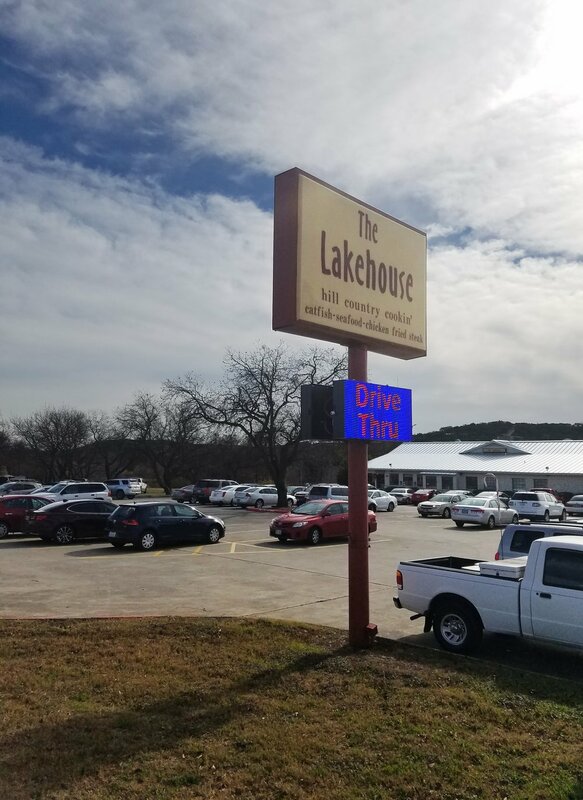 The Lakehouse is located at the corner of a busy intersection and the digital sign installed by TEU runs constantly, informing drivers of the latest specials and highlighting just a few of the many tasty menu items offered inside or at the drive thru. The messages can be changed at any time and Mark reaches more people regularly without tying up his time and money. RFM Commercial actively develops office and retail properties in San Antonio and the surrounding areas. 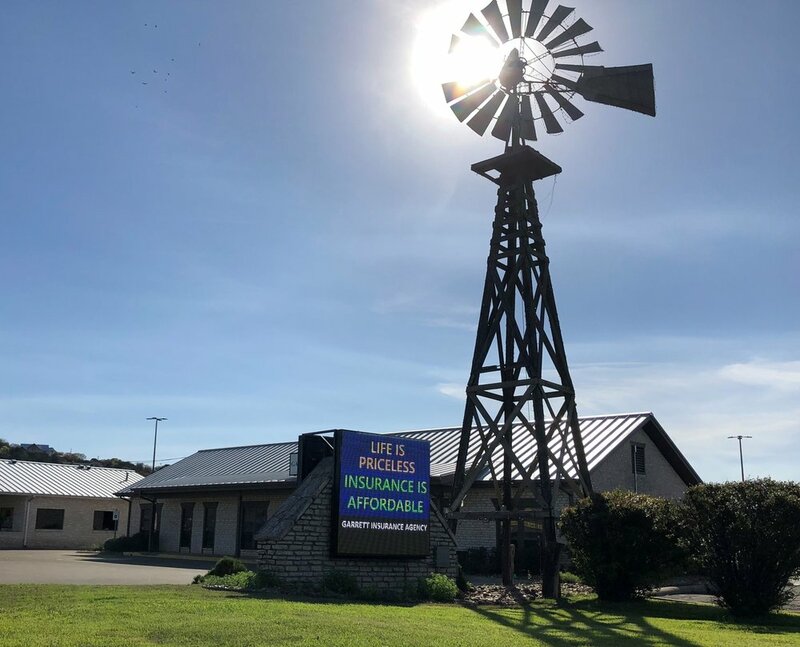 Their Creekside location is a multi-tenant retail and office complex set in the heart of the booming Bulverde area. The five buildings, constructed from stone and stucco, are arranged within about 4 acres in a quiet, park-like setting, walking distance from a variety of dining and banking options. Huge live oak trees surround the beautiful metal roofed buildings, providing much needed shade on hot Hill Country days. Before the LED lighting upgrade, this made the parking lot areas extremely dark and a safety concern in the evening as the trees blocked out a significant portion of the light produced by the older, dimmer lights. TEU's engineering team created photometric designs to select the correct fixture type and wattage that would provide the best lighting levels at a ratio of 3.1 footcandles which is recommended for most outdoor parking lot applications. The customer is extremely pleased with the increased light levels and the tenants now feel safer walking to their cars in the evening. Rohde, Ottmers & Siegel Realty markets a wide range of land, commercial buildings and retail centers. Their Brokerage division was ranked one of San Antonio's largest Commercial Property Leasing firms. TEU upgraded their retail property located off Loop 410, the Autobahn Center. Light distribution is greatly determined by the type of light fixture used to illuminate. Many of the older fixture types used for parking lot lighting are very inefficient, projecting much of their light up and out the sides rather than directing it down towards the surface of the parking lot where it is needed. A number of the existing metal halide parking lot lights and wallpack fixtures at the Autobahn Center were below an acceptable level of illumination for customer safety due to inefficient design and age. Light levels in a parking lot can be improved considerably with more modern fixtures that are designed for efficiency. 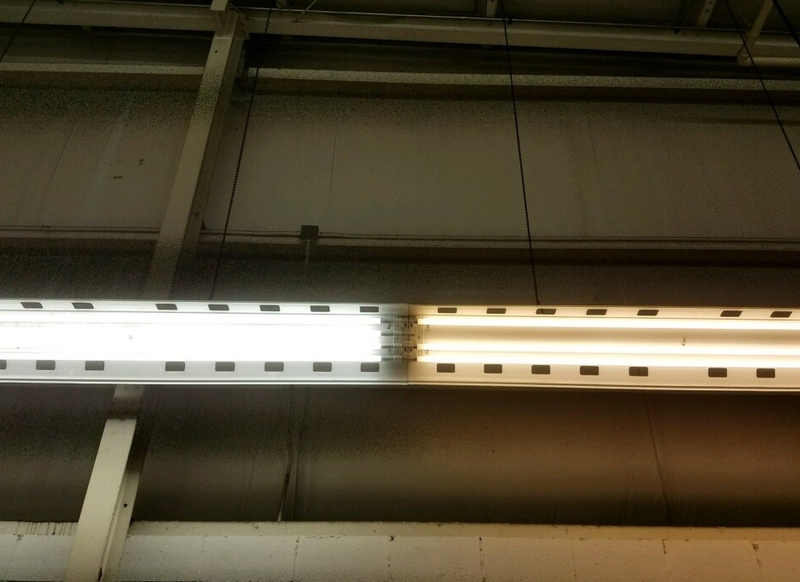 TEU replaced the old, discolored and dirty fixtures with completely new ones, improving the light quality and providing a more uniform look throughout the retail center. Garrett Insurance offers a wide variety of insurance options. 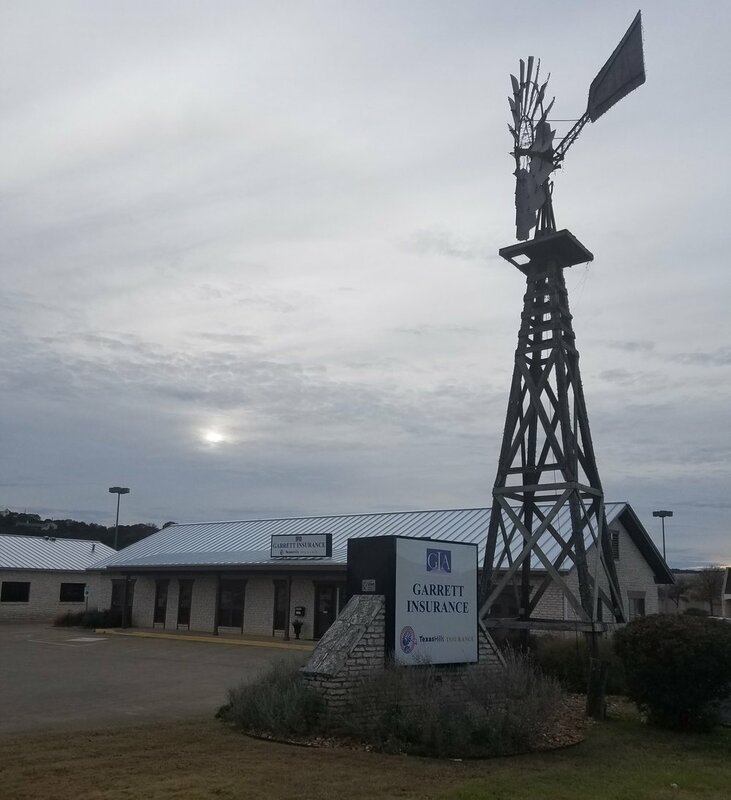 With insurance lines from Nationwide, Allstate, Progressive and Liberty Mutual, this agency can easily handle the residential and commercial insurance needs of Kerrville, Texas and the surrounding areas. All their clients are served with tailored products and personalized services. For a hundred years, Garrett Insurance has demonstrated hill country hospitality at its finest. It was time to share their message with everyone driving past on Sidney Baker south. Well-designed and displayed signage is seen by so many individuals on a daily basis that it remains one of the most cost-effective ways to advertise. The double-faced electronic message center provided by TEU was sized to be securely installed in the rock structure where the static sign was once mounted. Multiple campaigns can be scheduled on the provided playback system that will play dependably anytime, any day. The agency's production team can now efficiently get the word out that Garrett Insurance offers all types of insurance and that all are welcome to stop in for a cup of coffee and excellent service. Ahlstrom-Munksjö is a world leader in sustainable fiber-based solutions. The innovative materials they produce are used in a wide variety of areas, such as food packaging, filtration, décor and health care. TEU Services upgraded the manufacturing plant in Madisonville, KY. 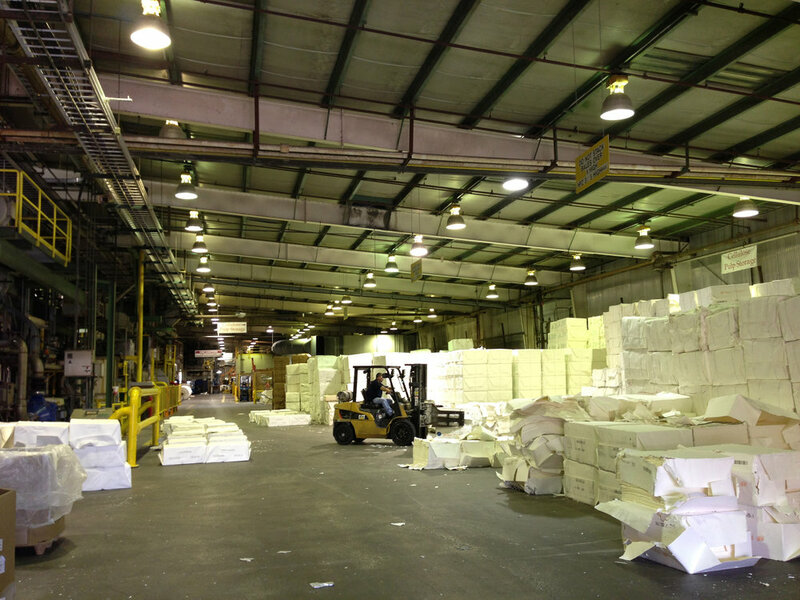 The lighting levels in the Ahlstrom plant ranged from 30 foot-candles (fC) under the older 1,000W metal halide bulbs up to 85fC under the newest ones. The uneven, multi-colored lighting had become unacceptable to management. TEU was selected for the project after some in-house testing. To provide the best solution, TEU's engineering team started with a photometric design that promised to deliver 55fC evenly throughout the facility. Since the maintenance crew at the plant had no experience with lighting designs or photometrics, TEU decided to conduct a pilot install. Upon completion of the pilot install, tests revealed that 57fC was achieved, exceeding the design by 2fC. 5000K LED highbay fixtures were installed in the entire facility, reducing the energy consumption by 71% and providing an even 57 foot-candle illumination. Founded in 2000, Venture Commercial leads the DFW area in retail brokerage. One of the many properties they manage is the Hulen Fashion Center, a 182,069 sq. ft. neighborhood shopping center located less than a mile from Hulen Mall and home to many major tenants including Men’s Wearhouse and Chili’s Bar & Grill. Venture buys older properties that are in need of an upgrade. The lighting of the Hulen Fashion Center was old, outdated and dark, especially in the two inside corners. There is a gym located in one of the corners and a school of dance in the other. In the wintertime with the shorter daylight hours, it became unsafe for the mothers and children going in and out in the evening. options. Venture selected the best option with the brightest lighting, tripling the light levels in the parking lot and improving safety. TEU will not just match the existing light levels but improve them when necessary. Texas Roadhouse is a legendary steak restaurant with a Western theme serving American cuisine from mouth-watering steaks and ribs to made-from-scratch sides. Many know it for its free buckets of peanuts at each table along with free yeast rolls. The chain operates about 450 locations in 49 U.S. states. Texas Roadhouse has a distinct warm and friendly environment, illuminated with pink incandescent lamps in the track fixtures and silver tip A-lamps in the pendant fixtures above the tables. They had a goal of saving energy and less maintenance but didn’t want to alter their existing aesthetics in the dining area. The kitchen’s fluorescents needed to be upgraded with a brighter, white light that required less maintenance. Creating a solution that fit these set requirements was a challenge TEU was ready to take on. 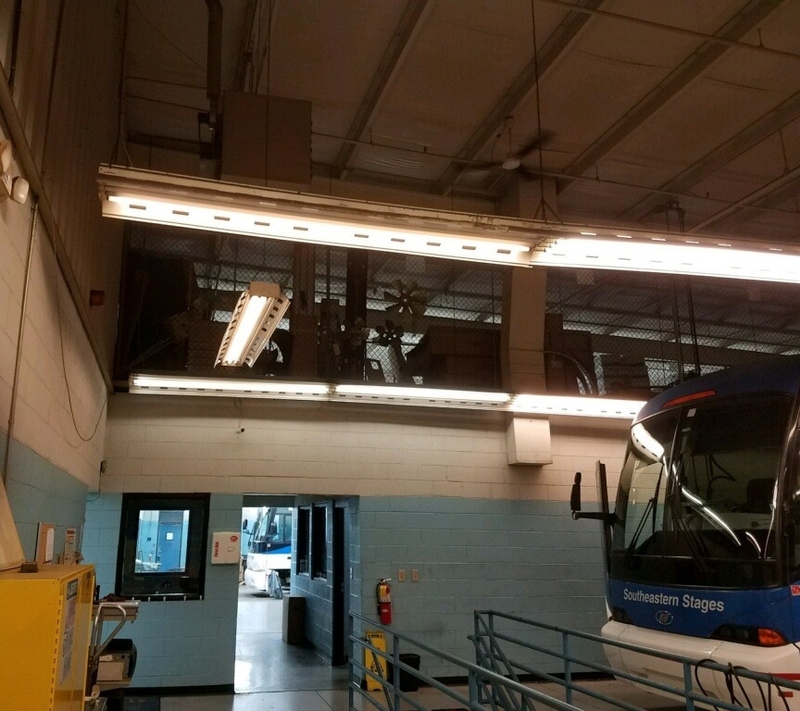 After some testing to provide the correct color, beam angles and lumen output in the dining area our Lighting Designers selected pink 9W LED BR lamps to replace the 65W incandescents in the track fixtures and 5W silver tip LED A-lamps to replace the 60W A-bulbs above the tables. In the kitchen the 40W 4’ fluorescents were retrofitted with 5000 Kelvin, 19W LED lamps to brighten and visually enhance the task at hand. The TEU Engineered Solution allowed Texas Roadhouse to keep the same aesthetics in their dining area, brightened the kitchen and reduced their energy consumption an average of 72.6%, with LED lamps under warranty for 5 years. Since 1933, Southeastern Stages has served travelers as one of the premier motor-coach operators in the United States. Their modern fleet of over 40 sleek motor- coaches, operates daily between the cities of the Southeast, logging more than 3 million miles each year. Southeastern Stages invests heavily in their vehicles for customer safety and comfort. They pride themselves on their dedication to the maintenance and technological advancement of their fleet. Their facility was well-equipped but the workplace had become dark and dingy as the lights aged and wore out. The height and location of the old fluorescents made burned-out bulb and ballast replacement a difficult task. The efficiency of the technicians was being hindered by the failure of the existing lighting. Southeastern was ready for an effective solution. The fixtures were retrofitted with crisp, vibrant 5000K LED lamps with high CRI, providing greater contrast between subtle details and allowing intricate projects to be worked on with greater precision. 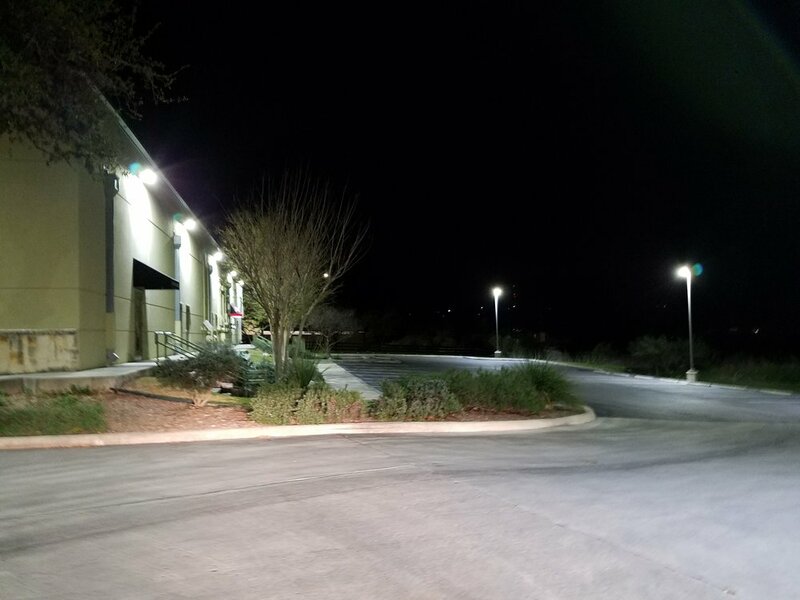 TEU's main goal was to brighten the shop areas but at the same time doubled the light levels in the parking lot through fixture redirection and increased lumen output. Southeastern's lighting maintenance inconvenience was removed, freeing the technicians to focus on the upkeep of the motor coaches, thus increasing productivity and meeting the company's high standards for safety. The parking lot lighting for the Commerce Bank in Wichita, Kansas was in need of an energy efficiency overhaul. 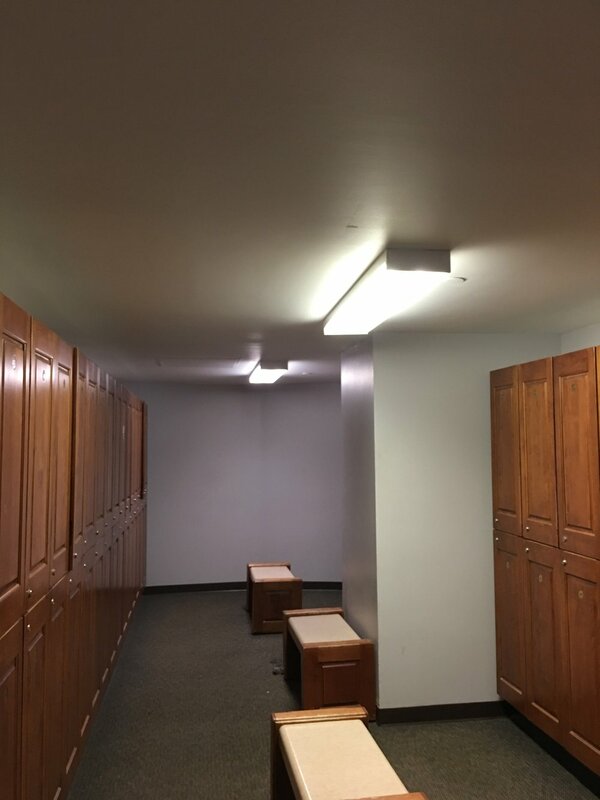 Improving the lighting levels for customer safety was a strong motivator to select LED fixtures for the job. TEU partnered with Ed Pearmain, owner of Light Bulbs Etc. in Wichita. Ed’s crew can always be counted on to provide on-time, professional services and Commerce Bank was pleased with the finished project. The existing pulse start MH fixtures stayed on all night each night and were long past their prime. Many had dropped below an acceptable level of illumination for customer safety and comfort. 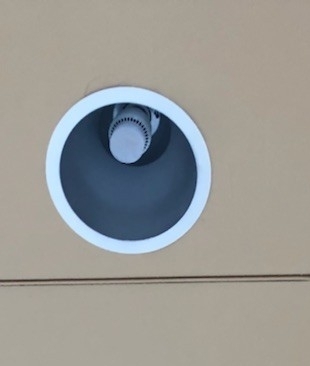 TEU considered using a retrofit product, but opted to remove and replace the old fixtures with completely new fixtures to provide long life and low maintenance. TEU’s Engineering Team started with a photometric design to determine the max/min ratios and prove the delivered footcandles. Light Bulbs Etc. handled the Pilot Install and the entire upgrade. The new 5000K LED fixtures delivered a more even beam spread, increased visibility and color recognition for the security cameras plus a 64% energy reduction. Firehouse Subs is a US-based fast food restaurant founded by former firefighters. Currently, they can be found in 1,095 locations across 44 states. TEU Services upgraded the location in Murfreesboro, TN. The common area lighting was 4' fluorescents, the track lights that illuminated the pictures and menu on the walls were CFL bulbs and the pendant lights were incandescents. The fluorescents flickered and took time to come to full brightness and all the lights radiated heat. Firehouse Subs was ready for energy efficient LED lighting and a maintenance reduction. TEU retrofitted all the fixtures with 5000 Kelvin to bring out the featured firehouse red in the restaurant. Electric consumption was cut by over 66%. Maintenance was greatly reduced and the majority of the heat produced from the traditional lights was removed. The LED upgrade improved the light quality and created light uniformity throughout the restaurant. Jamison Station is a residential HOA in downtown Historic Franklin, TN. The red brick design is both classic and reminiscent of the warehouse district. 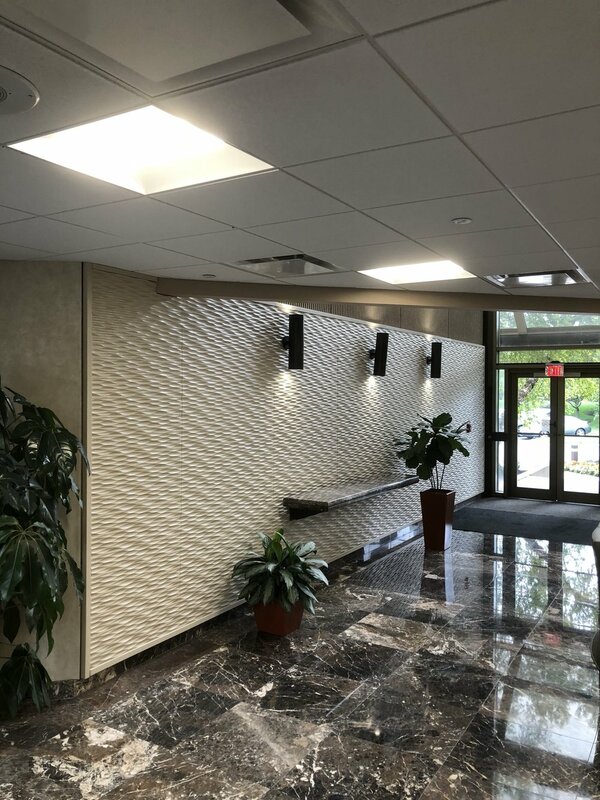 TEU Services was selected for the lighting upgrade based on the ability to combine energy reduction with competitive pricing while creating the desired ambiance that had been lost during the traditional lighting maintenance cycle over the past years. The before photos reveal exterior lighting of multi-color and varying intensity, depending on the age and droop of the light bulbs, not very flattering for such a beautiful structure. The metal halide fixtures in the underground parking garages were long past their prime with burned lenses and many bugs. The covered walkway lighting in the rear had cracked, aged lenses and provided a home for the many summertime insects. The period correct fixtures and custom made wall sconce fixtures were preserved and retrofitted with 3000K LED lamps to enhance the beauty of the red brick. The underground parking garages and above ground parking lot fixtures were removed and replaced with 5000K LED to brighten the parking spaces and enhance color rendering. The covered walkway received new fixtures with occupancy sensor/daylight-dimmer controls to provide dim lighting during the night, but bright light when a homeowner or guest appeared. In the greenbelt, a new 25ft tall light pole with LED fixtures was installed to provide night-time illumination for the home owners who wanted to walk their dogs at night.